I found this recipe on the Country Home magazine website. Originally was for leftover turkey but I changed it to chicken. Place the onion, fresh ginger, garlic, and water in a blender or food processor. Cover and blend or process until smooth. In a 12-inch skillet, cook the blended onion mixture in the hot oil over medium heat, stirring constantly, for 1 minute. Add the curry powder; cook and stir for 1 minute more. Stir in the coconut milk. Add chicken, cauliflower, salt, and pepper to the skillet; stir to combine. Bring to boiling; reduce heat and simmer, covered, for 15 minutes. Add the frozen peas; cook and stir for 2 minutes more. Stir in cilantro. Serve chicken mixture over mashed potatoes or rice. If desired, garnish with cashews and serve with chutney, pickles, and/or raita. Makes 6 servings. Revised original recipe from turkey to chicken. I would also half boil a couple of cubed potatoes and add, along with the other vegetables. 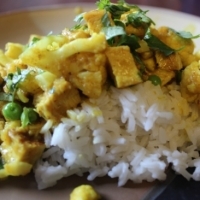 Potatoes, cauliflower and peas make a delicious curry all by themselves, without meat. Per serving: 399 cal., 14 g fat (5 g sat. fat), 88 mg chol., 640 mg sodium, 29 g carbo., 4 g fiber, 37 g pro. Rave reviews from whole family. I just changed the order a little: first sauteing the onion, garlic and ginger before processing it, then adding the curry powder and coconut milk to the processor before pouring it into the pan/skillet and continuing. This sounds amazing. I bet it's good with chicken or turkey. Thanks for the post. Like the sounds of this one. must try!!! This sound super,will have to try very soon! Like thepiggs's recipes? Never miss an upload!